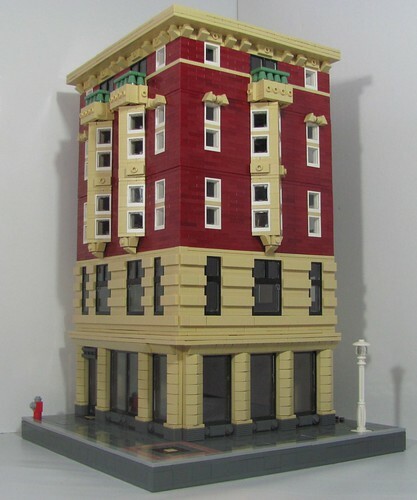 Brick Town Talk: Going Old School - LEGO Town, Architecture, Building Tips, Inspiration Ideas, and more! After a little break this week, Brick Town Talk finally returns with this terrific high rise building by Shuppiluliumas. The architecture and design on this structure is phenomenal; not too detailed, so as to take away from the original look but detailed enough to come across as a real building. My favorite part of this is probably the tan bay windows shooting up from the third floor to the cornice. It has a very appealing look to it. Check out the inspirational building for a side-by-side comparison!